At Windo VanGo serving the greater Baltimore area, we’re proud to carry the full line of Hunter Douglas window fashions. And we’re prouder still when we can offer our customers savings on the most popular products. If you’re in the market for new window treatments, now’s a great time to buy. Read on to learn more or speak with one of our representatives today. Sonnette™ Cellular Roller Shades. (Buy 4 units to earn a $100 rebate; earn a $25 rebate for each additional unit.) Streamlined like a roller shade, Sonnette gently diffuses light through an innovative, curved shape. Available in 48 colors (from whites to brights) and in semi-opaque and room-darkening opacities, Sonnette Cellular Roller Shades will enhance any space. 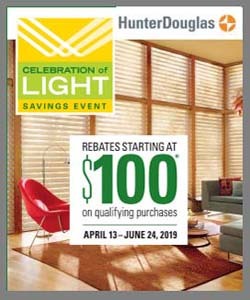 Once you fill in your rebate form and send it to Hunter Douglas with a copy of your receipt, they’ll review the info and will approve your claim. Then they’ll send the appropriate rebate in the form of a prepaid rewards card. It’s easy! Additional restrictions could apply—and more products are eligible than are in this blog post—so speak with a representative for full details.